A NASA satellite image of the Thar Desert. 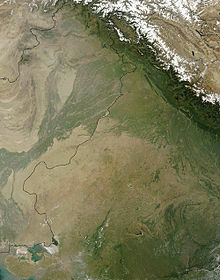 The image also shows the international border between India and Pakistan. The desert is at the center left of the image; the Indus River and its tributaries are to the left side of the desert, and the dark green line at the bottom center of the image is the Aravalli Range. The Thar Desert (Hindi: थार मरुस्थल, Urdu: تھر دسیرت‎), also known as the Great Indian Desert, is a desert. About 85 per cent is in western Republic of India and the rest in southeastern Pakistan. It is mostly in the Indian state of Rajasthan. It extends into the southern portion of Haryana and Punjab states and into northern Gujarat state. In Pakistan, the desert covers eastern Sindh province and the southeastern portion of Pakistan's Punjab province. In Pakistan's Punjab province it is known as the Cholistan desert. Tharparkar District of province Sindh Pakistan is also a part of Thar desert. The Thar Desert is bounded on the northwest by the Sutlej River, on the east by the Aravalli Range, on the south by the salt marsh known as the Rann of Kachchh (parts of which are sometimes included in the Thar), and on the west by the Indus River. Its boundary to the large thorny steppe to the north is not well defined. Depending on what areas are included or excluded, the nominal size of the Thar can vary. This page was last changed on 24 April 2017, at 22:39.